BlackBerry is in dire straits. The smartphone maker was riding high in market share and profits just a few years ago, but it's now having trouble securing rescue money. It's yet again pinning its hopes on a new CEO who's tasked with saving a struggling industry giant. How did BlackBerry decline so quickly, though? And what might happen to the company when seemingly every option is on the table? As it turns out, BlackBerry's descent into trivial market share figures and sustained losses stems from a mixture of hubris, sluggishness and misplaced effort -- and there's no clear solution in sight. If there's any overarching cause for BlackBerry's woes, it's that the company neither anticipated nor responded quickly to the threats posed by Android and the iPhone. As The Globe and Mail revealed in an interview with former co-CEO Mike Lazaridis, the 2007-era iPhone was a complete break from what the Waterloo firm knew. BlackBerry was focused on efficiency, keyboards and security; Apple devoted its attention to broadly appealing concepts like performance and ease of use. Even if BlackBerry's criticism of the iPhone at the time was marketing bluster, as Lazaridis now suggests, it still reflects a company that wasn't taking its competition as seriously as it should. Despite having an initial edge in the corporate world, BlackBerry was facing an uphill battle when trying to court a wider audience that didn't care about encrypted email or network bandwidth. The tech giant didn't just lose its grip on the mainstream smartphone market; it was also slow to acknowledge the Bring Your Own Device trend. BlackBerry was aware that it had to adapt, but its first response -- 2008's Storm 9500 -- did little beyond graft touch on top of an aging platform. The Storm's ultimate failure led Verizon to give up on BlackBerry as a sales leader and focus its attention on Android handsets like the Motorola Droid, which is widely considered the platform's first smash hit. BlackBerry didn't start revamping its OS in earnest until it bought QNX in 2010, which gave both Apple and Google a huge opportunity to build market share. And they sometimes did so in ways that BlackBerry hadn't expected. The tech giant didn't just lose its tentative grip on the mainstream smartphone market; it was also slow to acknowledge the Bring Your Own Device trend, which saw workers replace company-issued BlackBerrys with personal smartphones. The company magnified its problems by squandering QNX's technology. Rather than concentrate on improving its smartphone platform and preventing customers from jumping ship, BlackBerry spread its resources thin and built the PlayBook as a response to the iPad. The tablet was billed as the end of Apple's "amateur hour," but it amounted to a poorly executed distraction; BlackBerry rushed the PlayBook to market without implementing its greatest advantage, native email, and faced disastrous sales as a consequence. 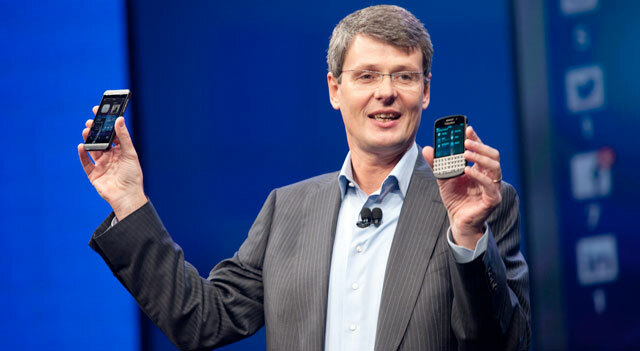 Thorsten Heins would eventually scuttle the tablet strategy during his tenure as CEO, but by then the damage was done. BlackBerry 10, the company's overhauled smartphone platform, was late. Many argue that Heins revitalized BlackBerry by addressing cultural issues and narrowing development on fewer devices. There's some proof to back up the claims: the BlackBerry 10-based Z10 and Q10 launched to positive (though not ecstatic) reviews, for example. However, there are also signs that Heins made mistakes of his own. The Globe and Mail claims that the ex-CEO insisted on launching the Z10 first despite warnings that the handset wouldn't stand out as well as a QWERTY model, and it bombed. Heins also left BlackBerry with few alternative sources of revenue, in part because he dropped a plan to replace SMS with BlackBerry Messenger. The chat service is relatively popular now that it's available on both Android and iOS, but those additional platforms don't generate money -- just buzz. For now, BlackBerry has to fend for itself. So what's next, now that Heins is gone? In the short term, not much. While $1 billion in debt-based financing gives the phone designer some relief, interim CEO John Chen hasn't had much chance to say what he'll do to turn the company around. Smartphone production will continue. There are rumors that seemingly every company from Facebook through to Qualcomm is considering an acquisition bid, but nothing has advanced past the exploratory stages. 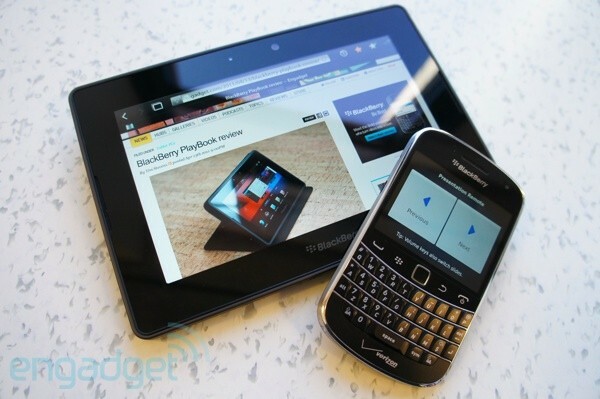 For now, BlackBerry has to fend for itself. Even if it does find a willing suitor, there's no guarantee that fans will like the result. Rumored candidates like Google or Lenovo have little incentive to sustain BlackBerry's hardware or software businesses when they already run their own operations. Instead, they're more likely to buy the ailing mobile pioneer to either assist in patent battles or fast-track an in-house project. They may sell or shut down whatever they don't need. BlackBerry is still an independent company, and it may remain that way if it can get its costs in check and release devices or services that enjoy some success. Should someone eye a takeover, though, there's a real chance that BlackBerry will share Palm's fate -- subsumed into another company, with few traces left of its unique character. 0 Response to "Cracking up: a brief history of BlackBerry's fall from smartphone dominance"